The rules of archery tag vary from location but the basic tenets involve two teams of five people facing off across a tennis-sized court, a 20-foot safety zone between them. When the whistle blows, the goal is to hit your opponents and knock out their targets. 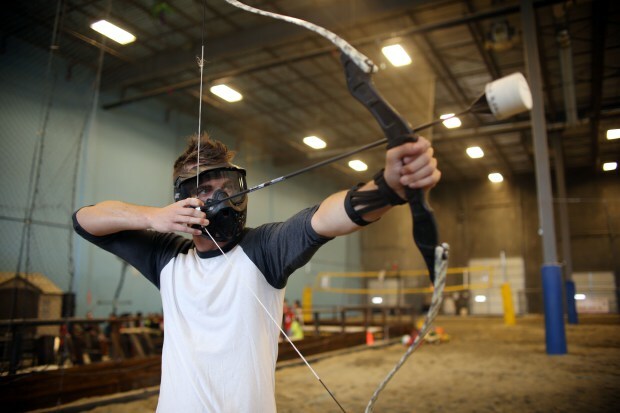 Each player is equipped with a custom recurve bow, arrows and a face mask (for safety). “When you get hit, you feel it,” Jackson says, emphasizing the importance of playing safely — other bows might cause serious bruising with the arrows. Jackson’s heard the “laser-tag for Katniss” analogy, but thinks archery tag offers a more physically interactive experience, as players are constantly moving and collecting ammunition — and groaning at a hit. He estimates players pay around $3-$10 a person and says it’s a non-intimidating introduction to archery, as no experience is necessary. After a short tutorial on how to lock and load, you’re good to go. And it’s taking off. Currently archery tag has 380 licensees in 31 countries, including Colombia, India and New Zealand. This demand is clearly related to the rising popularity of archery — as a sport — worldwide. Sarah Bernstein from USA Archery says membership has increased 262% from 2011-2014, with a 105% increase in women since 2013. She credits Hollywood movies like Brave and The Avengers (both have archers). And the Hunger Games, obviously. But USA Archery doesn’t endorse archery tag, or mention it on their website and they wouldn’t comment on its potential. Teresa Johnson from the Archery Trade Association says that 21.6 million people participated in archery in 2014 (that’s 9.2% of Americans!) 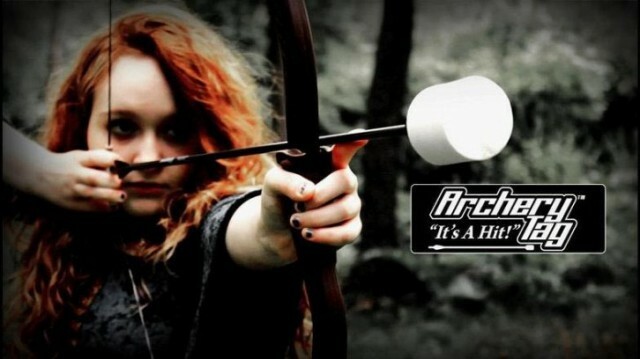 — and that archery tag’s a great way to get people excited about the sport. If you’re planning on trying it out, be warned: Players need to be in reasonable shape — including good upper body strength — and have a good pain threshold, of course. Not everyone’s capable of the exertion archery tag requires, and while foam-tipped arrows aren’t deadly, getting shot isn’t a comfortable experience. And for those itching for another Hunger Games movie (it’s all over now), this could be a healthy way of burning off that pent-up frustration. And if you’re feeling extreme, there’s always the option of concocting new ways to play — such as 3D FlyBoard style … Or not.